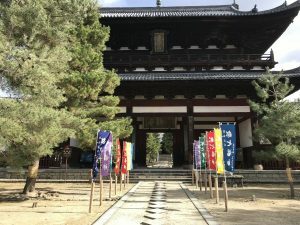 In 1733 , Myouhou-ji Temple was opened as a Zen Temple of the Obaku-shu Buddhism school by kyuu-hou-kei Zen Master. 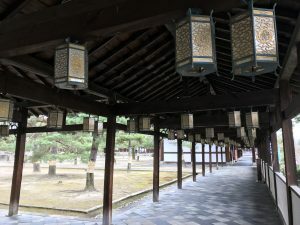 At that time, Oumi merchants were flourishing in the middle of the Edo period. 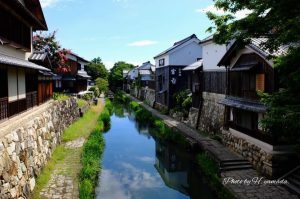 Hachiman canal was used by Oumi merchants as a distribution route to deliver goods and products. The town prospered through commercial activities, however, the merchant ships sometimes experienced accidents and shipwrecks. Therefore, Gosen-Kannon (Kannon Buddha to protect ships), the main buddha statue, was deified at the temple. Standing on a ship with a rod, “Gosen Kannon” (secret buddha) is a very rare wooden statue in Japan. A beautiful blue sea was painted inside cabinet which encloses it. About 1,200 years ago, it is said that “Gosen Kannon” was carved from the parts of a wrecked ship. Divine Support by Gosen Kannon and other Buddha: Ship Protection, Safety Travelling, Passing Examination, Success in Business, Health, Salvation from suffering, Long Life, Recovery from sickness. Kannon Buddha is believed to save people from various sufferings or agonies. 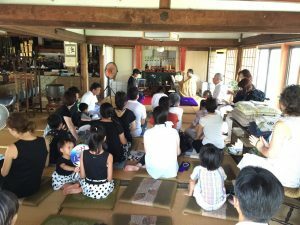 In an old story, during sailing on a boat, when people came across severe storms during sailing, as soon as they prayed to “Gosen-Kannon” for help, the storm suddenly became quiet and peaceful. Eventually, the people on the boat were saved by “Gosen Kannon”. 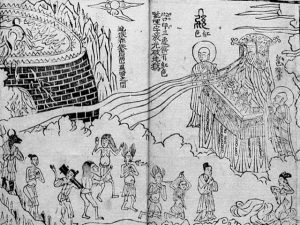 It was 838 CE that Ennin, a disciple of Saicho who is also known as Jikaku-Taishi, joined an envoy to Tang Chinato study Buddhism. In 847, the ships carrying Ennin and other envoys back to Japan were caught in a storm. An ancient document describes the storm as follows: “The waves were so high as to wash away rocks and stones, and the clouds that covered the sky were so thick as to turn the day into a dark night. Even the captains of the envoy ships lost their calm.” In fact, the storm was so violent that the captains lost their control of the ships, and one of the four ships carrying back the envoy from Tang China was lost at sea and sank to the bottom of the ocean. In the midst of this violent storm Ennin invoked Bodhisattva’s name, looking up towards the sky. Immediately, a Bodhisattva appeared in the sky emanating luminous lights to protect the ships. 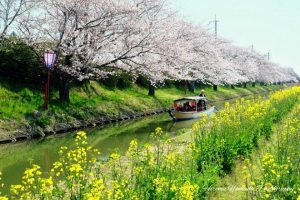 The shining sun appeared as the dark clouds were cleared away and, as the violent head wind turned into a gentle tail wind, the ships were able to reach the coast of Matsuura in Hizen (the present-day Nagasaki prefecture). However, the captains lost control of the ships as they tried to bring passengers ashore, and the ships broke into pieces, forcing Ennin to swim to the shore, almost drowning while trying to do so. After safely on the land, the captains asked Ennin to carve out the statue of this Bodhisattva who appeared on the sea and saved them. Ennin thus carved the statue of Gosen Kannon (the Bodhisattva who protects the ships) out of a piece of wood from the envoy ships that had broken into pieces as they reached the shore. 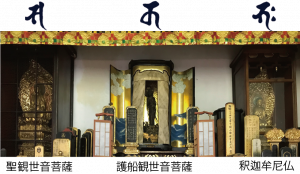 As soon as the statue was completed, “Gosen Kannon shone with bright light emanating from its body, prompting the captains to become Ennin’s disciples in awe of the power of his faith,” says an old document mentioned above. 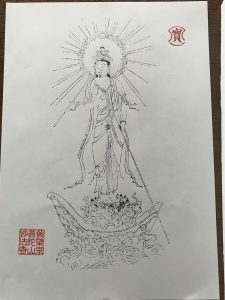 The same document also describes the captains making a drawing of this Bodhisattva on paper and pasting it on their ships as a good luck charm for the safe voyage of their ships. 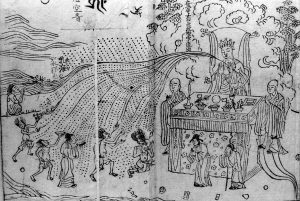 The document goes on to describe Gosen Kannon as the protector of ships against winds and waves at sea and thus would become a savior for the populace in the future. 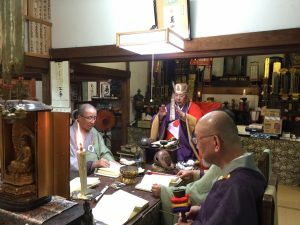 Omi merchants, who used Hachiman-bori as the route to ship their products, dedicated Gosen Kannon to Myohouji-temple, where it sits, as the Bodhisattva of the protector of their ships against winds and waves as well as the guarantor of their business fortunes. In Obaku-shu Zen Buddhism, priests usually read the sutra in Tang pronunciation. Tang was an ancient China/Korea kingdom during the 7th century. The sutra sounds like music. You can listen Oubaku sutra in main hall’s sound system. 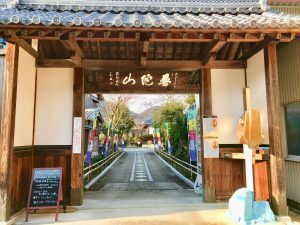 “Segaki” is a memorial ceremony to pray for the happiness of a loved one who has passed away and to save people turned into “Gaki” (starving evils) who have fallen into hell. “Zeni-yama”, “Kane-yama” is an event at which specific ornaments made of paper are set alight to generate luck in money and wealth. It is said that if you keep the fragment of the ornaments in your purse, you will have financial good fortune during the year. 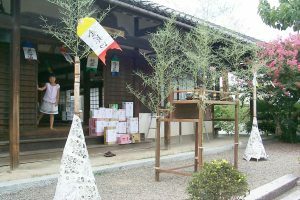 “Segaki” ceremony will be held from 18:00〜20:00 on August 19 every year. ・Purify the field with holy water. ・Fire on the mountains of money and clothes. ・Give rice cakes and sweets to hungry demons. When a priest pronounces a spell, the gate of hell opens. The priest gives rice cakes and sweets to hungry demons and dead. 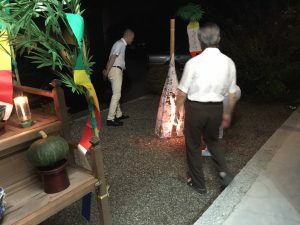 In the middle of the ceremony , fire the mountain of “Zen-yama” and “Kaneyama” . Everyone pick up the burning residue. If you can pick it up, you may get rich. The priest Ingen Zenji founded the Obaku-shu school of Zen Buddhism in Japan in 1661. 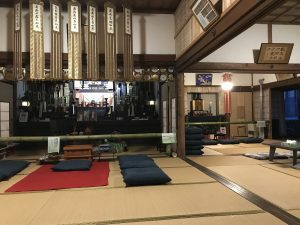 It is now one of the three major Zen Buddhism schools in Japan. 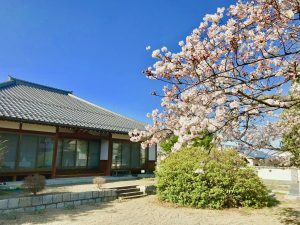 The Obaku-shu Zen Buddhism school was founded in Japan as a part of the Rinzai-Shu Zen Buddhism school during the 17th century. At the time of the Min Dynasty in China, it belonged to Rinzai-shu school of Zen Buddhism. In 1876, Obaku-shu became officially independent from Rinzai-shu. 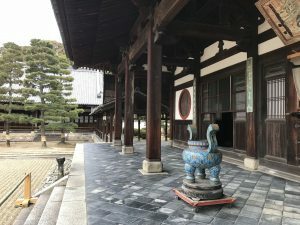 The Head Temple of Obaku-shu Zen Buddhism is Manpuku-ji temple located in Kyoto. Go to the Head Temple of Oraku-syu Manpuku-ji Temple.